Much better and more complicated than the cheaper movement found in he current Formula 1. 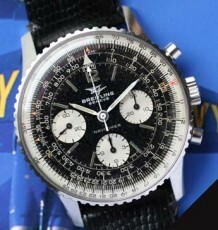 This model uses the same Chronograph movement as the Tag Heuer Pilot model. The current Formula 1 Chrono does not have an hour register. 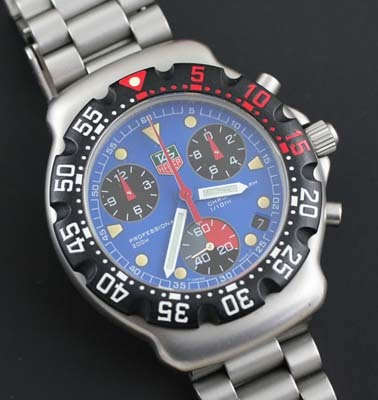 The second Tag Heuer Formula chronograph I have had in recent memory. These original generation F1 Chronos use a far superior movement to the one currently used in the Formula 1 series Chronograph. 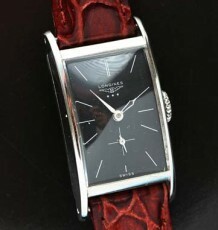 This particular watch uses a minute indicator hand running around the minute register of the radiant blue dial to show up to 60 accumulated minutes. The register at 9 o’clock is used as a 12 hour accumulator. The current production F1 Chrono simply uses the 9 o’clock register as a 30 minute accumulating register. The register at 3 o’clock is a tenths of second indicator. I also prefer the look of this design as opposed to the new model but that is really a matter of personal preference. The watch is also stamped on the back as the Official Timekeeper of the FIA Formula 1 World Championship. 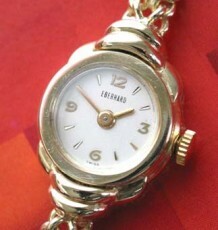 The watch dates to about 2000 and is in outstanding condition, virtually unworn. 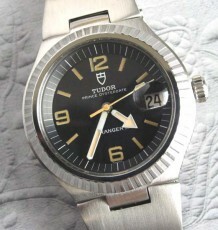 No damage or wear to the unique bezel featuring full red numerals from 0 to 15 minutes.